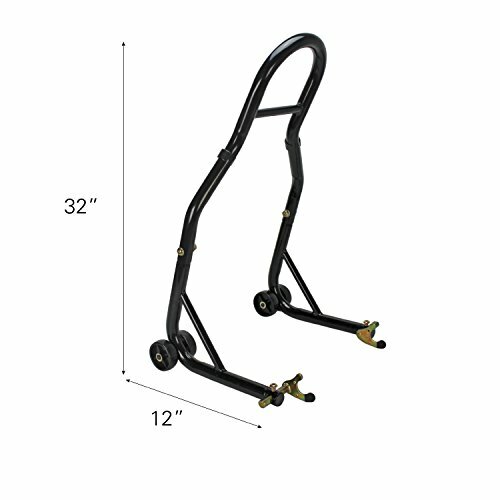 Lifting your sport bike for maintenance or storage is easier than ever with the Sport Bike Motorcycle Front and Rear Lift Stand from Extreme Max Products. 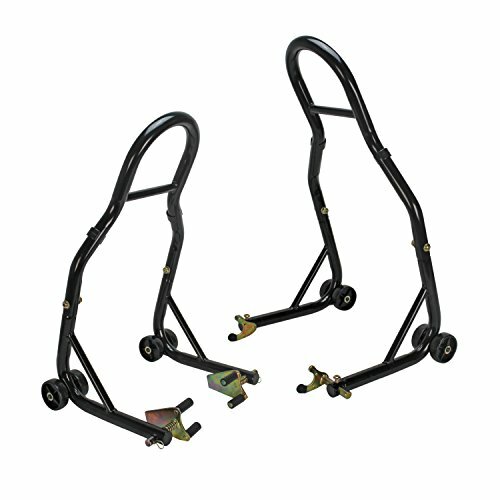 Consisting of two individual lifts that work separately or as a unit, the front lift stand nestles underneath your front wheel forks, cushioned with rubber padding that will not scratch your forks, while the rear lift stand cradles your dual-side swing arm spools (not included), getting your bike off the ground and into the perfect position for maintenance, repair or storage. 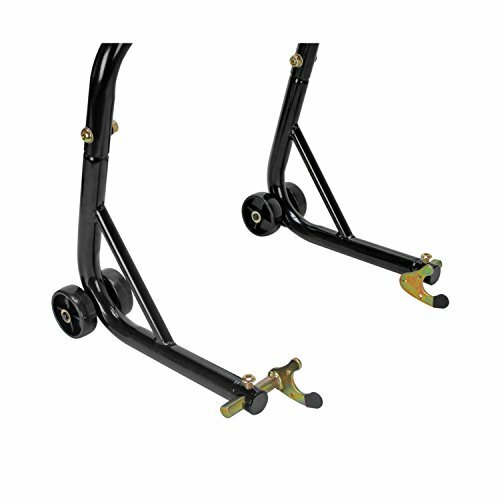 Each stand features a substantial width adjustment, creating a custom fit for nearly any sport bike; the front mounting fork width expands from 9.5” to 12.5” while the rear spool attachment opens from 10.75” to 14.5”. As possibly its best feature, the lift stands are incredibly easy to use. Once you know the width measurement of your forks and spools, lock the stands into the matching width. From there, wheel the stands into position and simply lower the handle down for a nice, smooth lift. The handle then becomes the stand’s base, wide enough to maintain stability and strong enough to never sag. 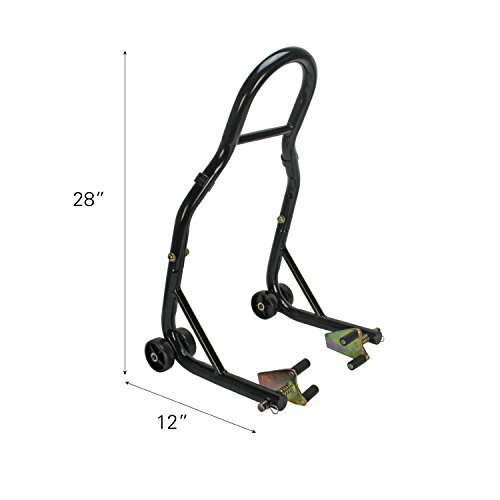 Note: Swing arm spools are required for use with the rear lift stand and are not included. Extreme Max recommends that all bikes be secured to the stands with straps while lifted as an additional safety measure. 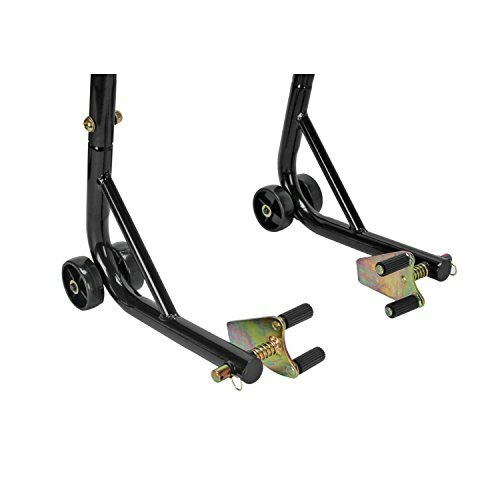 * Swing arm spools are required for use with the rear lift stand and are not included.